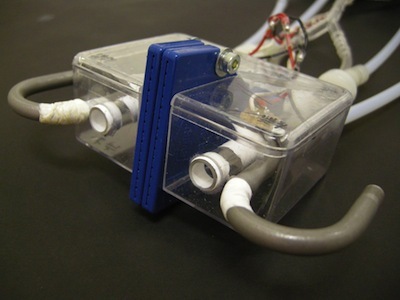 The Active Stereo Nose is a differential gas sampling system that can be used to find the sources of airborne gas plumes or underwater chemical plumes. It was developed by a research team led by Hiroshi Ishida, Associate Professor in the Department of Mechanical Systems Engineering, Tokyo University of Agriculture and Technology, Japan. The Active Stereo Nose sampling system is biomimetic; it follows the example set by nature in the way a aquatic animals like crayfish tracks the smell of food.. The current research in our group is focused on the development of robotic olfactory sensing systems that can detect odor plumes and track them down to their sources. The potential applications include searches for gas leaks, fire origins and hazardous chemicals. Animals perform a variety of feats by integrating information perceived at various sense organs in an exquisite way with actions to acquire new information. The goal of our research is to reveal mechanisms underlying the animal behaviors, to transfer the findings into engineering technologies, and to make innovative robots that currently considered to be a science fiction into reality. 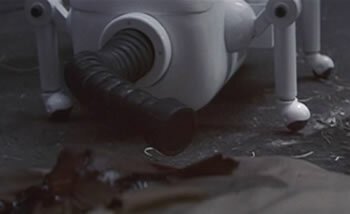 SF film goers may also recall the sniffer robot from Michael Crichton's 1985 film Runaway. As you can see, the sniffer robot sniffs in mono, not stereo. From Robots Podcast via Robots.net and Ishida Hiroshi.